From Isshindo Honpo Co. in Tokyo, it’s a set of chocolate Shogi pieces, one each king, rook, bishop, knight, lance, pawn, gold general, and silver general. The pieces are regulation shape and size, and endorsed by the Japan Shogi Association. Though made of the same chocolate, the different pieces are said to present different textures, mouth-feel, and scent. 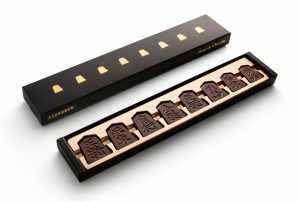 Available January 26th, a set of Shogi de Chocolat will retail for ¥1400.